No matter whether you’re a growing business or just starting a remote team, making payments to international employees is one of the most important processes to perfect early on. How you pay remote team members or international employees can make a big difference in fees, timing, and ease of use. Considering each platform’s benefits will save you time, money, and hassle. Here’s our breakdown of four of the most popular online payment services, all of which integrate with Hubstaff, to help you decide which one is the best for you. How long will it take to send virtual payments? How much will it cost to use Hubstaff’s automated payroll feature with each payment service? Which provider makes the most sense for your business? Here’s a quick comparison chart so it’s easy to decide. PayPal is one of the first online payment services. Founded in 1998, the company we now know as PayPal used to be called Confinity. Two years later, Confinity joined forces with X.com, an online banking company developed by the CEO of SpaceX and Tesla Motors, Elon Musk. PayPal has been operating under its name since 2002 and remains one of the most widely used payment systems globally. PayPal has been around for a long time, and it’s the most recognized brand in payment systems. It supports a lot of currencies and banks across different countries, and automated payments when integrated with Hubstaff. PayPal has quite a lot of fees, which can add up to a significant amount. For receivers, and depending on the country, banks may have additional charges as well when withdrawing from PayPal into their bank accounts. Another issue with PayPal is that it sometimes holds accounts without warning, which is potentially disastrous when sending out large amounts. PayPal is used all around the world for online transactions, as well as online shopping. As of 2017, there are over 200 million active Paypal accounts. Since then, PayPal has extended its services to even more countries. PayPal is generally a good option, largely due to the sheer number of countries and currencies it supports. It is recommended for companies that send out less than $20,000 monthly. Anyone can use PayPal without registering for an account. However, if you’re going to use PayPal on an ongoing basis, it’s much more convenient to open an account. It’s easy and free of charge. The transaction fees charged by PayPal vary depending on a number of factors, including whether you are using your bank account, PayPal balance, credit card or debit card. The fee can also vary depending on whether you’re transferring money within the same country or internationally. The transfer fees range from 0.3% to 7.4%. PayPal also charges currency conversion fees. PayPal lets the sender decide whether transaction fees are charged to them or the recipient. 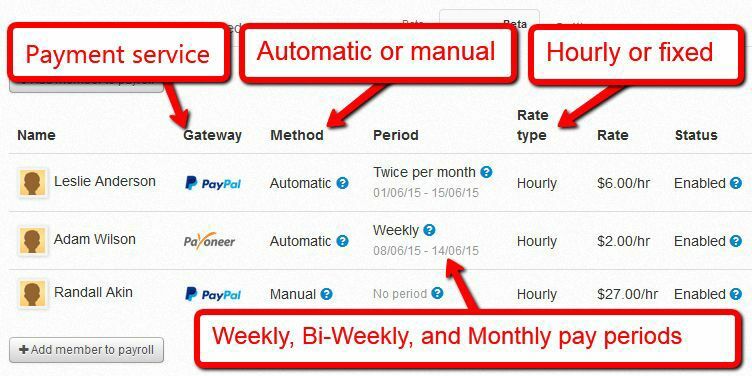 PayPal Payouts allows you to pay up to 10,000 people at once with no monthly fees. Hubstaff has a PayPal integration that allows us to pay our contractors automatically, easily and accurately on time, every time. Read about how Hubstaff saves $32,400 with a simple contractor payment system that uses PayPal Payouts. 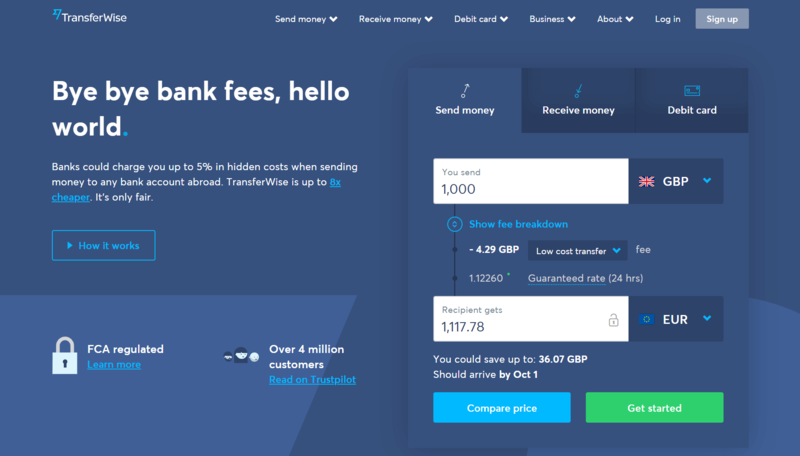 Launched in 2011, TransferWise is a relatively new service that provides online money transfers at the real exchange rate. TransferWise was developed by Skype’s first employee, Taavet Hinrikus, and Kristo Käärmann, a financial consultant. TransferWise’s biggest advantage is its low rates. You only have to pay for the mid-market exchange rate and the conversion fee. While TransferWise offers extremely cheap fees for both senders and receivers, its reach is relatively short with only 48 countries. Use it if you are based in a country which isn’t supported by PayPal, or if you’re fee-cautious. TransferWise has gained a lot of attention as a solution to the high bank fees most would like to avoid. TransferWise converts your money at a mid-market rate, and the transaction fees are deducted before the conversion takes place. Supporting over 300 currency routes, TransferWise is a great platform for sending money abroad. This online money transfer service charges no transfer fees for users making their first money transfer. Afterward, TransferWise charges 0.35% + £0.80 when sending from GBP. The reason people like TransferWise lies in the fast and simple transaction process. Unlike banks, TransferWise converts at the midpoint of buy and sell rates at the time of your transaction. Conversion fees start at 0.50% and go up depending on the currency. This makes TransferWise ideal for small transactions, but it gets significantly more expensive if you make bigger transfers. TransferWise also offers batch payments through Hubstaff to make payroll much easier. The bigger your team, the more time you’ll save. Payoneer was founded in 2005 with headquarters in New York. Some of the board members of Payoneer include the former president of Visa and former CEO of SWIFT. This company is a worldwide Member Service Provider of MasterCard. Some of the companies that use Payoneer include Google, Airbnb, iStock and Fiverr. Support for over 200 countries and 150 currencies, as well as the ability to directly withdraw funds with debit cards that they provide. Payoneer charges a flat $3 fee per transfer. Rates, and, depending on your account volume, exchange fees are typically higher than PayPal’s. Payoneer also has a minimum monthly payment requirement of $20,000. Payoneer is more fit for teams of larger sizes. Rates are cheaper as the amount of money sent is higher. Use it if you are paying your team more than $20,000 monthly. Payoneer and its services are available in over 200 countries and include over 100 currencies. With the refillable Payoneer MasterCard debit cards, Payoneer is great for businesses and working individuals. With Payoneer, there are two basic account types that you can register for. The first one charges no annual fees and permits you to withdraw money directly to your local bank account. The Payoneer account type that includes a prepaid Payoneer MasterCard charges an annual fee of $29.95. This account type is available only to individuals, not businesses. Payoneer offers several different mass payout packages for companies. The Small Business package supports a minimum of 10 beneficiaries and at least $10K in monthly payouts. For the Corporate package, you need at least 20 beneficiaries and $80K in monthly payouts. The Enterprise package is for 200 or more beneficiaries with a minimum of $250K in monthly payouts. Payoneer uses the midpoint of MasterCard’s official currency conversion rates. The transaction fees charged by Payoneer are $2.99 for a local bank transfer and $15 for a USD SWIFT transfer. Payoneer charges fees of $4 or 1% of the overall amount for transfers in USD and EUR, but the fees can’t exceed $10. With Payoneer, you can send money to your prepaid MasterCard, Paypal, or make a global bank transfer. Hubstaff also has a Payoneer integration that makes paying your independent contractors secure, easy, and automatic. Bitwage was founded in 2014 by John Lindsay and Jonathan Chester, who both worked at Oracle Corporation before. Like the other platforms, it aims to simplify the payment process. What sets it apart is its support of Bitcoin, and that bank accounts are no longer required for people to receive their payroll. Like PayPal, Bitwage has a mass payment option with slightly lower rates. It’s simple and straightforward. It’s also the only Hubstaff payment integration that supports Bitcurrency. Bitwage supports a limited number of countries. It’s not the best option if your team consists of people who come from many different countries. Who benefits from Bitwage the most? 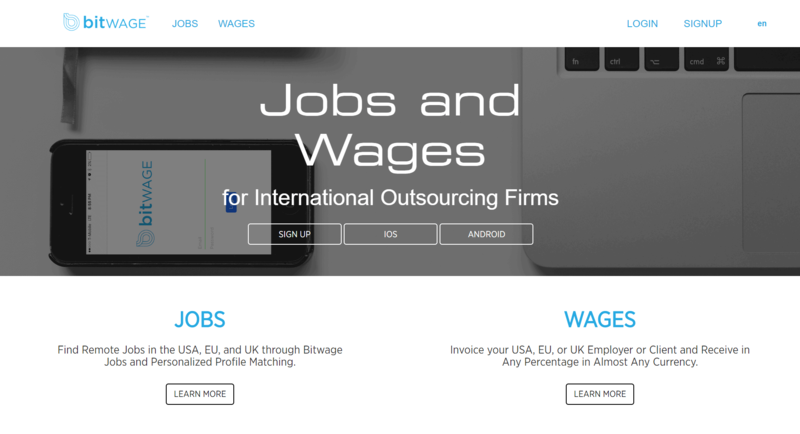 Bitwage is best suited for remote workers and for those who prefer to be paid in Bitcurrency. The reasonable rates and mass payment option make it a good option if your team is entirely US-based or is in the list of supported countries. Bitwage charges 0.5% for ACH debits per payroll. For credit card transactions, there is a 3.5% charge plus an additional $0.30 per transaction. Currency conversion fees start at 1%. Transactions take around 1 to 5 business days to process, although many report them to be on the faster side. For those who are interested in Bitcurrency, Bitwage supports Bitcoin. However, you will need a Xapo debit card for this. Setting up a Bitwage account is free. Once you have successfully created an account on their website, integrating it with Hubstaff is fast and easy. The number of people working remotely keeps growing, and so does the number and size of remote teams. It’s easy to choose a payment system if you’re in charge of a small team that won’t grow in the foreseeable future. However, if you have a big remote team with employees from all over the world, the payment process is usually not that simple. Hubstaff is an all-in-one productivity software solution for remote teams. Its features include time tracking, employee monitoring, project management and automatic money transfers. Hubstaff integrates with many other project management solutions and accounting platforms. To easily meet the different needs and preferences of remote workers worldwide, Hubstaff integrates with multiple payment systems, including all four mentioned here, as well. With Hubstaff, it’s easy to keep track of your time, projects and employees, regardless of their location. You can integrate Hubstaff with Payoneer, Paypal, Bitwage, or TransferWise – and pay your team members whichever way they prefer. This post was originally published November 27, 2015, and updated October 2018.